For once we have advance notice of a slogan postmark, courtesy of Design Week. 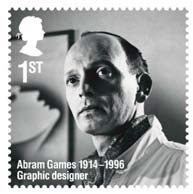 The Abram Games slogan postmark will appear on mail for four days from 29 July – the day Games was born – until 4 August, and will bear the text ‘Celebrating the life of Abram Games, Remarkable Lives Stamps, 1914-1996’. Among Games’ designs was the symbol for the 1951 Festival of Britain. We're hoping for more details about which mail (ie to which destination) will get this postmark.